It’s not your fault — but it is your money. If you’ve ever received a red light camera ticket in the mail, you are not alone. Unable to balance their budgets due to the economic downturn and reduced property tax receipts, municipalities nationwide are implementing new methods to generate revenue. The unannounced installation of speed and red light cameras at busy intersections has become an increasingly popular way for our elected representatives to increase revenues without the political stigma of having raised taxes. Make no mistake; this is not a safety issue. Despite studies showing that red light cameras actually increase the number of traffic accidents, local governments continue to install them at an alarming rate. For those who might doubt that the cameras are really about money — consider this — numerous municipalities have actually decreased the amount of yellow light time at intersections with cameras. This is contrary to best traffic control safety practices and serves only one purpose — to fool drivers into thinking they have enough time to safely make it through an intersection before the light turns red. If you believe that it’s time to fight back against these insidious devices and the citations they churn out — you’ve come to the right place. We have gathered the best products, services, technology, and know-how presently available to prevent, fight and beat unjust redlight and speed camera tickets. The cover has a slim lens that diffuses the light. When the camera takes a photo of the plate, the picture is distorted and unreadable. If the tag cannot be read, no ticket can be issued. Not even the police can tell that you are using a Reflector License Plate Cover as it is clear and inconspicuous. 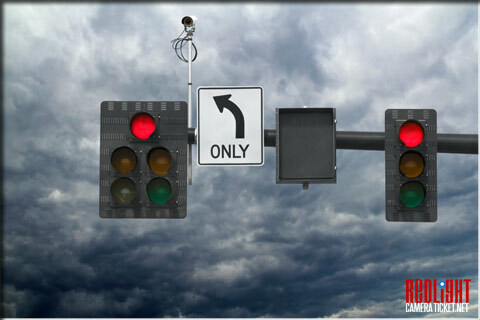 No red light camera ticket can be issued if no one can read the license plate…. Easy-to-read and use, the Fight Back ebook that will save you money on redlight and speed camera tickets, traffic attorneys, and auto insurance rate increases. PLEASE NOTE: RedlightCameraTicket.net does not condone the use of the products reviewed on these pages for running red lights, speeding, or avoiding the payment of lawful tolls. These activities are illegal and may endanger the lives of drivers and passengers, as well as your own. These products are designed solely to protect motorists from faulty red light and speed cameras. In some jurisdictions it is unlawful to display on any vehicle a license plate which is obscured in any manner which inhibits the proper operation of an automated red light enforcement system. The affiliate, RedlightCameraTicket.net, the manufacturer and retailer assume no responsibility for any use or application of these products in violation of any applicable law. Before using these products, please check your state and local laws and regulations, and consult a qualified attorney. Always obey traffic regulations and applicable motor vehicle law. Click here to read our complete Affiliate Disclaimer.